...making your presentations simply professional! Static templates are now a thing of the past. The OneOffixx for PowerPoint templates guarantee perfect presentations in your company's unified corporate design. OneOffixx makes the simply impossible possible: Templates, colors, layouts, diagrams and other formattings comply with your company's specifications. Dynamic footers can be adjusted and positioned on a flexible basis. Simply ideal: Thanks to OneOffixx, users remain in the familiar Office environment, while working in line with the latest standards. 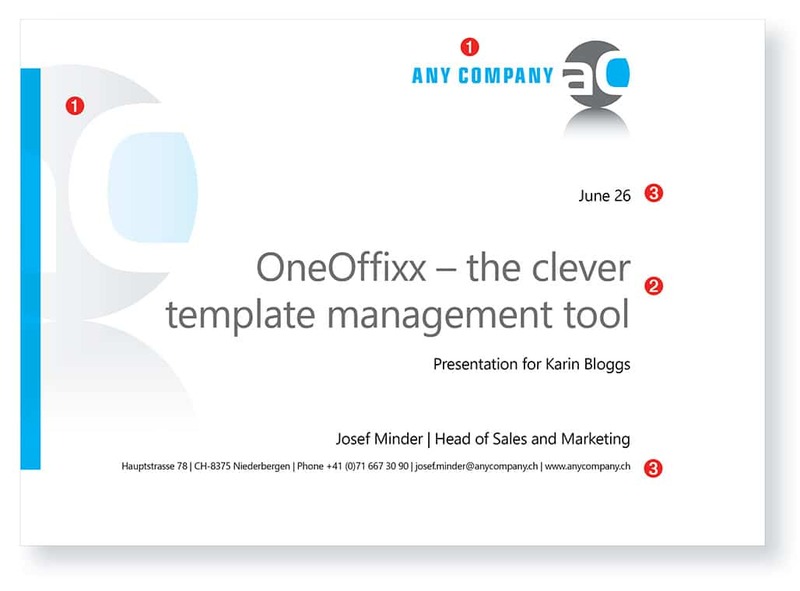 Once you have put OneOffixx to use, you will simply love it: Adjust slides from different presentations, as well as old layouts to your company's corporate design at the klick of a button. The image gallery enables you to move the correct images to the correct location. In case things get mixed up, you can adjust your slide to the compliance rules by taking advantage of the automatic slide correction. The laborious search for the latest company templates is now redundant. Your templates are integrated in Microsoft Office and configurated to your specific needs. Select the correct template for your new presentation and start preparing your content immediately. OneOffixx takes care of the rest. Simply dynamic: Presentations created with OneOffixx can be presented and adjusted on all devices. From zero to Office hero: OneOffixx for PowerPoint is your ideal contribution to success! OneOffixx for PowerPoint templates is available as a bundle with OneOffixx for Excel.